It’s Friday and YOU DESERVE A DRINK! 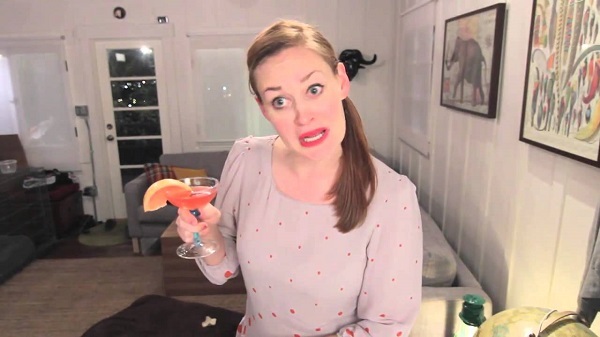 Therefore, you should definitely check out this week’s YouTuber of the Week: Mamrie Hart because she will teach you how to make fantastic drinks and laugh hysterically while concocting them. Cheers! I literally spent the last week just watching a crapload of Mamrie’s YDAD (You Deserve A Drink) videos and let me tell ya, I almost died because, you know when you laugh so hard your body concentrates so hard on laughing that it forgets to listen to your brain which is telling you to breathe? Yeah that happened with every video. It’s insane. And without actually making the drinks I managed to get giddy and hyper from watching YDAD that I didn’t even need a drink! That’s right folks, my laziness truly conquers all obstacles. Hey, I still had a pretty good time. Mamrie usually dedicates her concoctions to celebrities such as Lady Gaga, George Clooney, and Rihanna. She also cleverly names each of her drinks, such as: George Clooney’s Silver Fox, Lady Gaga’s Tasty Monster and Rihanna’s Hotty Toddy. My favourite of all time though, has to be her ‘Tyler Oakley’s My Ty Thai Mai Tai‘, because: genius?! Clearly, Mamrie has had plenty of experience bartending and enjoys a drink or two. Not only that but she is extremely talented, being a comedienne, actress, author, singer, and a YouTuber. People, she has a MOVIE out for crying out loud! But before the movie she was on YouTube so she qualifies for being on my top 10 favourite YouTubers of all time. Be sure to click all the links in this post to see the wonderment and beauty that is Mamrie Hart. I just want to make the world a better place.